[SatNews]... It will deploy the spacecraft during their launch by firing a pyrotechnic separation system to release them in opposite directions at the orbital insertion point. 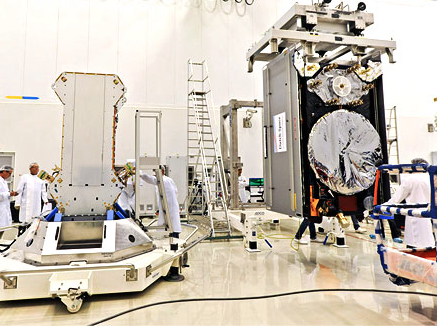 The first two Galileo Full Operational Capability (FOC) satellites are a confirmed "fit" for their Arianespace Soyuz launch later in 2014 after making initial contact with the medium-lift mission's dual-payload dispenser in French Guiana. This week's activity, called the fit check, was completed over a two-day period inside the Spaceport's S1A payload preparation building. The two satellites were installed separately, with the Flight Model #1 (FM1) spacecraft integrated on, and subsequently removed from, the dispenser on Monday, followed the next day by the same process for Flight Model #2 (FM2). 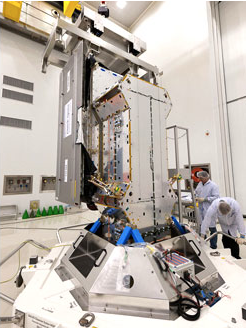 The payload dispenser for Galileo was developed by RUAG Space Sweden for Arianespace, and is to carry the Full Operational Capability satellites in a side-by-side arrangement. It will deploy the spacecraft, which were built by Germany-based OHB System, during their Soyuz launch by firing a pyrotechnic separation system to release them in opposite directions at the orbital insertion point. while Flight Model #2 (FM2) is shown integrated to the side of the RUAG Space Sweden-developed dispenser in the photo at right. system, following four Galileo In-Orbit Validation (IOV) spacecraft previously orbited on two Soyuz missions: a pair on Flight VS01 in October 2011, and two more on Flight VS03 in October 2012. As Europe's initiative for satellite navigation, the Galileo program provides a highly accurate global positioning system under civilian control consisting of 30 satellites, along with European control centers and a worldwide network of sensor and uplink stations. Galileo's complete operational and ground infrastructure will be deployed during the Full Operational Capability phase, which is managed and funded by the European Commission. The European Space Agency has been delegated as the design and procurement agent on the Commission's behalf. The Soyuz mission with Galileo's two Full Operational Capability satellites is designated VS09 in Arianespace's numbering system, signifying the workhorse vehicle's ninth liftoff from French Guiana to date.